'Share The Road,' Or No Bikes On Boston Streets? 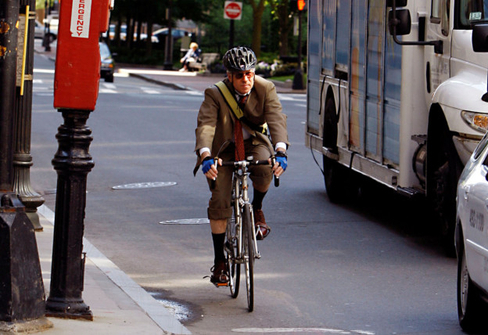 A man rides a bicycle on his morning work commute through downtown Boston. INTRO: We undoubtedly have some urban transportation challenges here in Boston, with increasing worries about deadly collisions between bikes and cars. Just last month, we were reminded of that when Anita Kurmann, a 38-year-old medical researcher, was struck and killed by a tractor-trailer while turning on to Beacon Street in Back Bay. She was at least the 13th cyclist killed in Boston since 2010. There is also a growing number cyclists in Boston — they've doubled since 2007. But continued tragedies like Kurmann's are prompting calls for protected bike lanes and demands that motorists "share the road." It sounds reasonable if you're a cyclist. But Boston Globe columnist Jeff Jacoby says bikes don't belong on busy city streets. In an op-ed, "Urban Roads Aren't Meant For Bicycles," Jacoby wrote that the tragic death of Kurmann is the latest reminder that "cyclists and traffic don't mix." He says, "It's not just foolish to pretend otherwise. It's deadly."